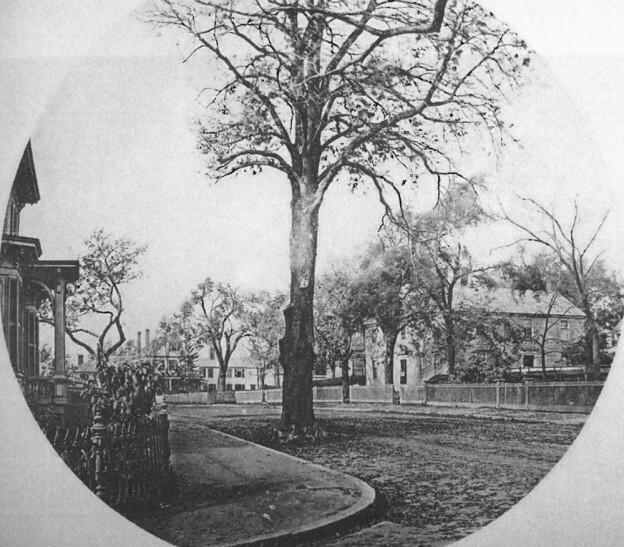 Brattle Street Widens, 1873, View of the “Spreading Chestnut Tree” in front of the Pratt House, the location of the smithy of Longfellow fame. From W. J. Stillman’s Poetic Localities of Cambridge. Henry Wadsworth Longfellow published his famous poem, “The Village Blacksmith,” in the November 1840 edition of the literary magazine, The Knickerbocker. Cambridge blacksmith Dexter Pratt was the inspiration for the poem. Longfellow often passed by the Pratt smithy – located on Brattle Street – as he walked from his house towards Harvard University, where he was a professor of Modern Languages. Blacksmiths held a place of honor in the Longfellow Family. The poet’s great grandfather, Stephen Longfellow, owned a smithy in Newbury, Massachusetts. Forty years later, the “Spreading Chestnut Tree” that so captured Longfellow’s imagination was cut down to widen Brattle Street. Knowing how important the tree was to the poet and generations of children who memorized the lines, Cambridge asked its children to donate a small amount towards a commemoration of the tree. An armchair was made from the wood and given to Longfellow on his 72nd birthday. One of his last poems was “To the Children of Cambridge” thanking them for reminding him of both the glory of the tree and his youth. 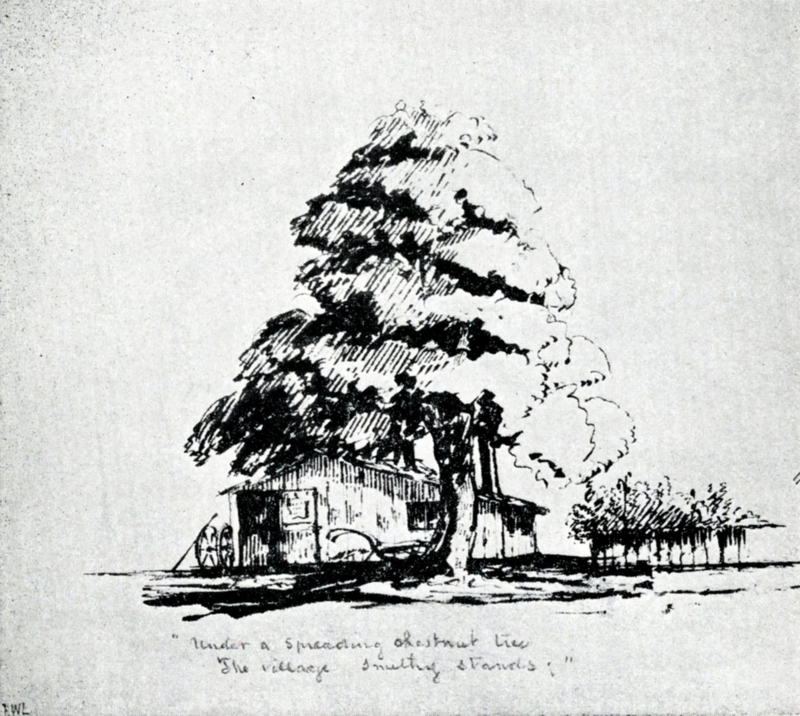 Other memorabilia from the “Spreading Chestnut Tree” was created, including a section of the tree and a paper knife, which made their way to the Cambridge Public Library and are now a part of the Cambridge Room collection. of the Cambridge Historical Society, vol. 25, p. 40.